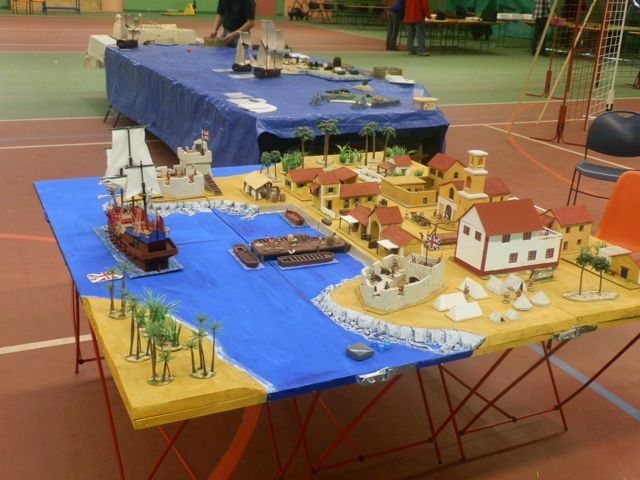 On october 29th-30th we played a WoSS (War of Spanish Succession) and pirates games in Theix (Brittany). 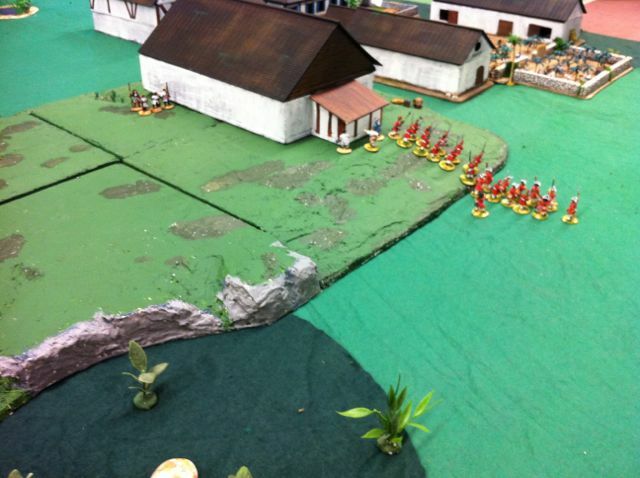 There were three tables ; troops and boats could go from one table to another. It was supposed to be in St-Domingue / Hispaniola. 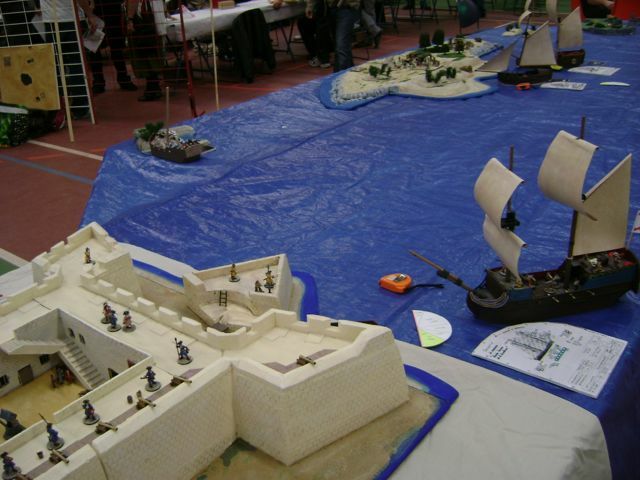 On the first table were a Spanish fort and some islands. This table was intended for initiation of newcomers, and had to be crossed to reach the two other tables. 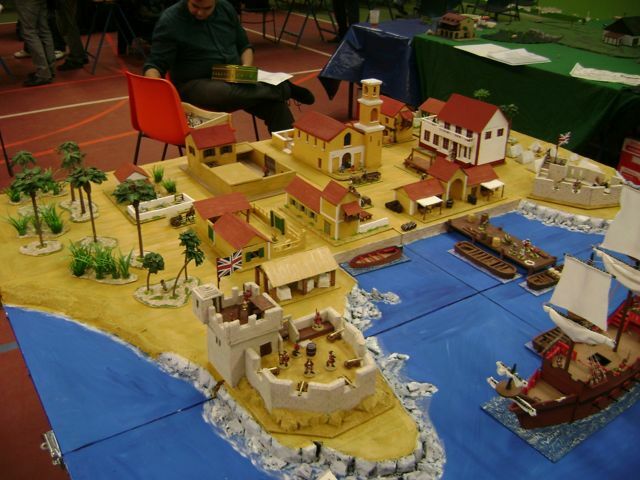 On the second table was a former Spanish town, Santa-Cruz de Barahona, in the scenario it had be taken by the English and named Port-Elizabeth. (yes I know the British flag is not correct for the period). 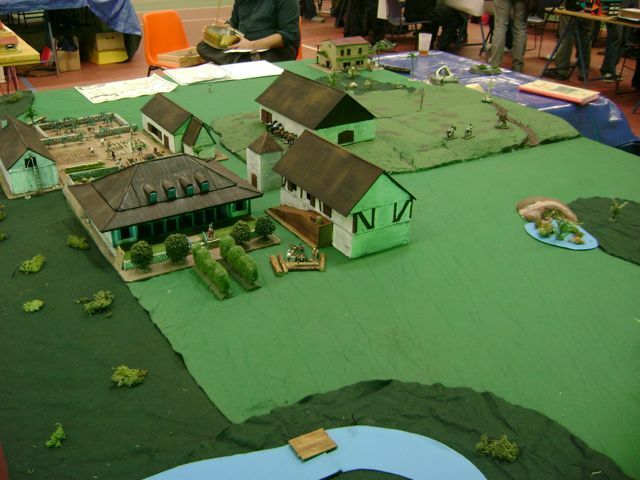 On the third table, a French colonial plantation (the western part of Hispaniola / St-Domingue had been given to France by Spain at the treaty of Ryswick in 1697). On the hill you can notice two French cavalrymen riding after a mysterious dark rider; we shall meet him again. 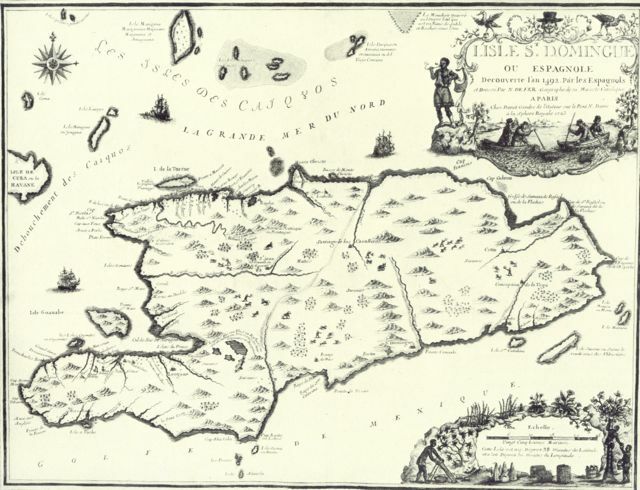 A copy of an old map of Hispaniola / St-Domingue was shown to the visitors to explain the story. On saturday afternoon we only had a few hours to play. A Spanish ship carrying French Marines, and a French privateer ship, try to find their way between some pirates and a big English ship. On the second table, a few French cavalrymen ride into the English town at full gallop, shoot a man at random in the street and ride away. 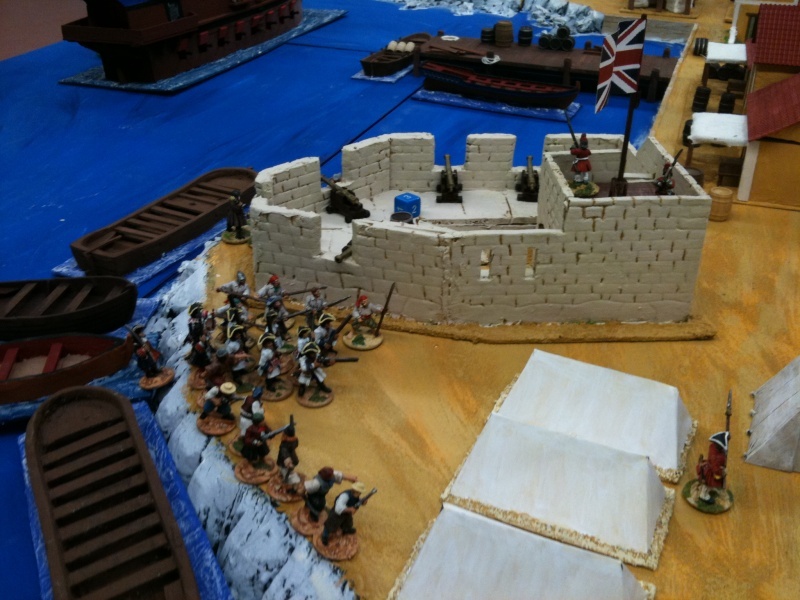 They have been sent by the governor of the French colony to have a look at the defense of the English town. 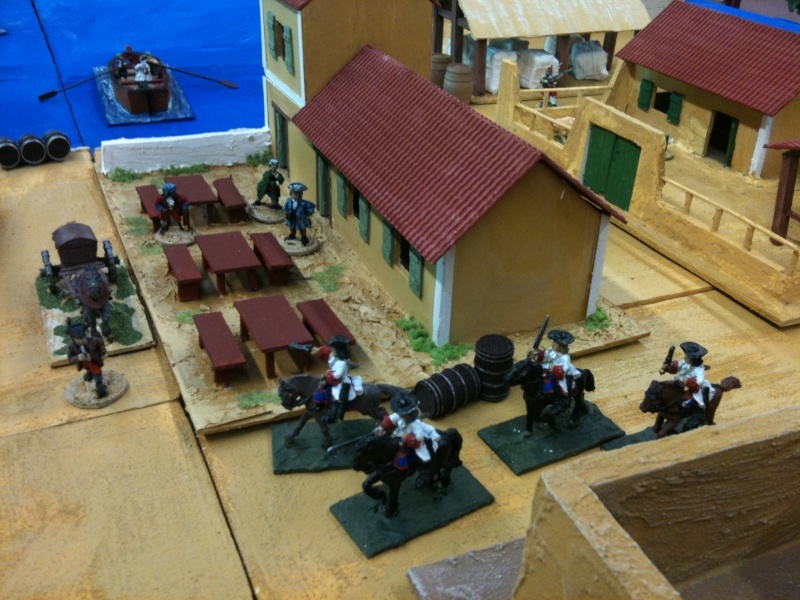 The French Marines officer and the French privateer arrive at the French colony. The French governor tells them bad news: his own nephew had voluntereed to spy the English town, but has been captured by the English who will hang him the next day. 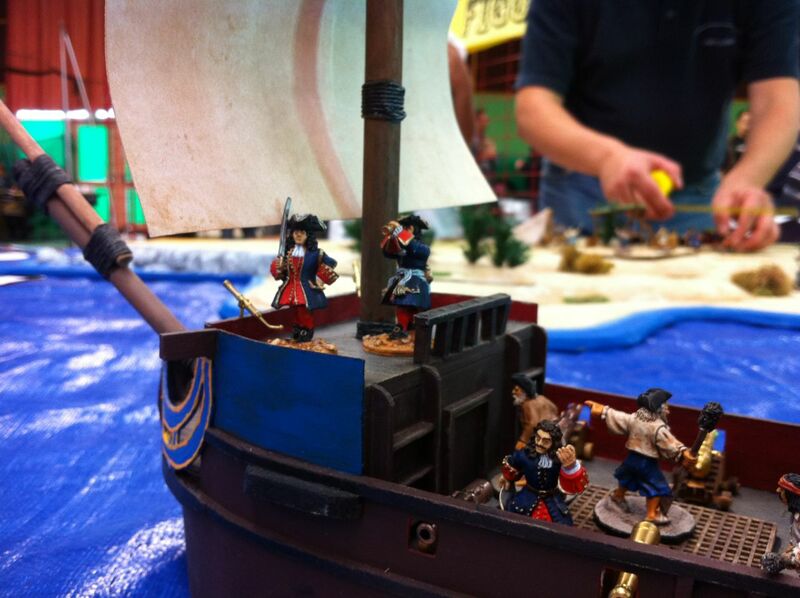 The privateer captain is unhappy of this because (in the scenario) this young man owes money to him! 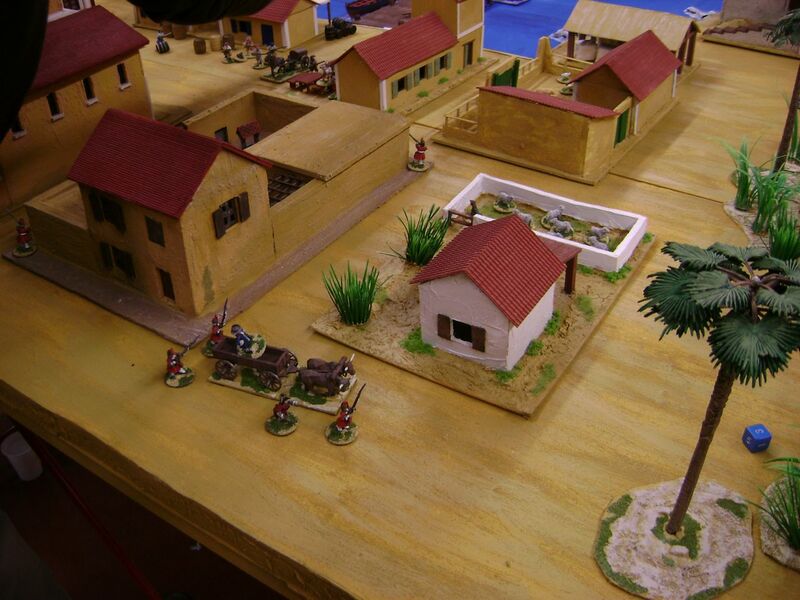 The Marines officer and the privateer decide to attack the English town by night (to be played on the Sunday morning). On Sunday we had much fighting and much fun! Bad luck : the attackers are seen by the sentinels as soon as they enter the table and they must attack immediately. But things go well for them. 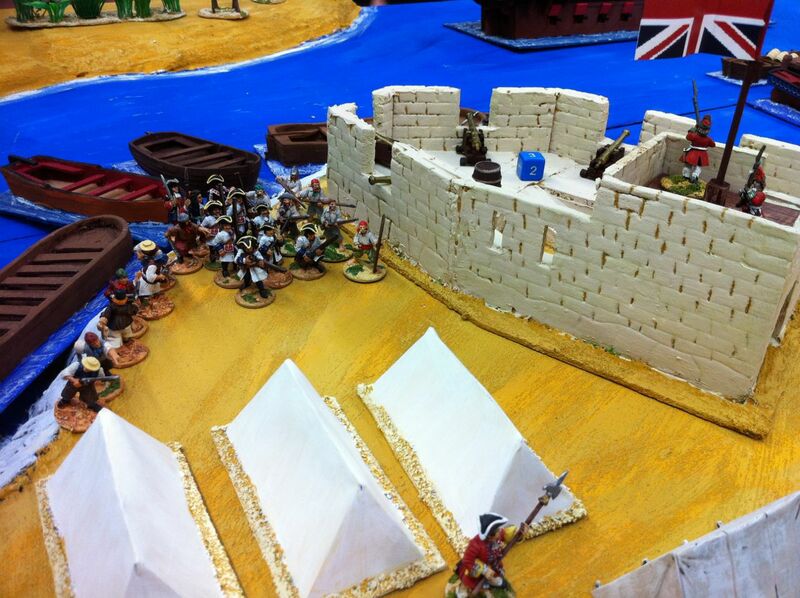 The privateers set foot in one of the fort, while the Marines kill the English in their tents. 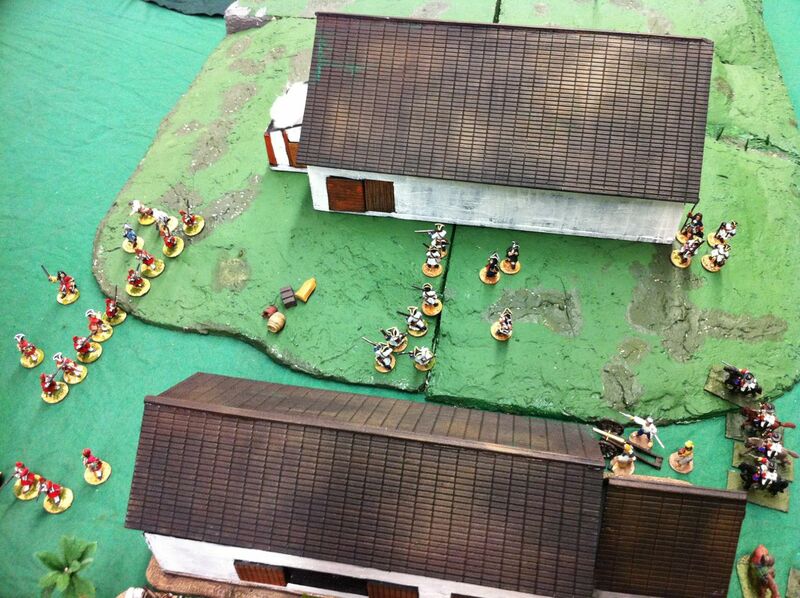 Privateers run across the town, and they see some English soldiers in another street. 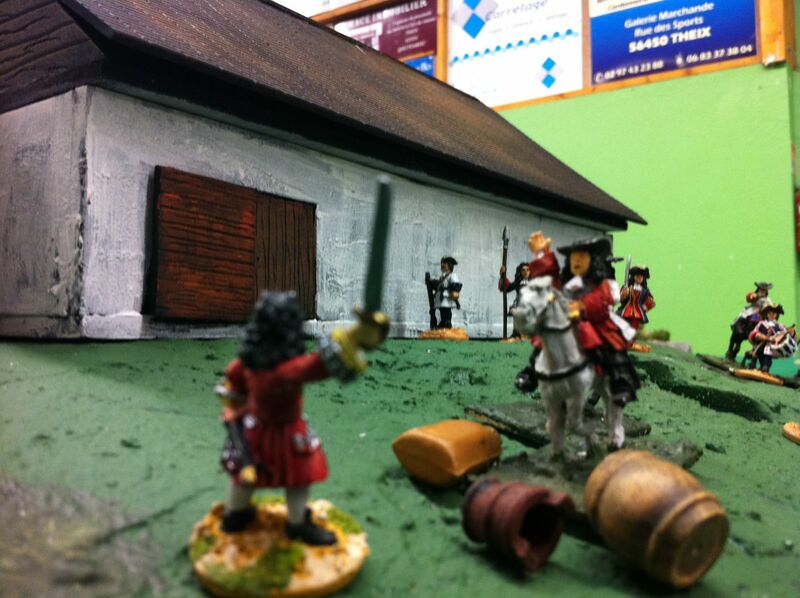 The English are carrying their prisoner to another fort! 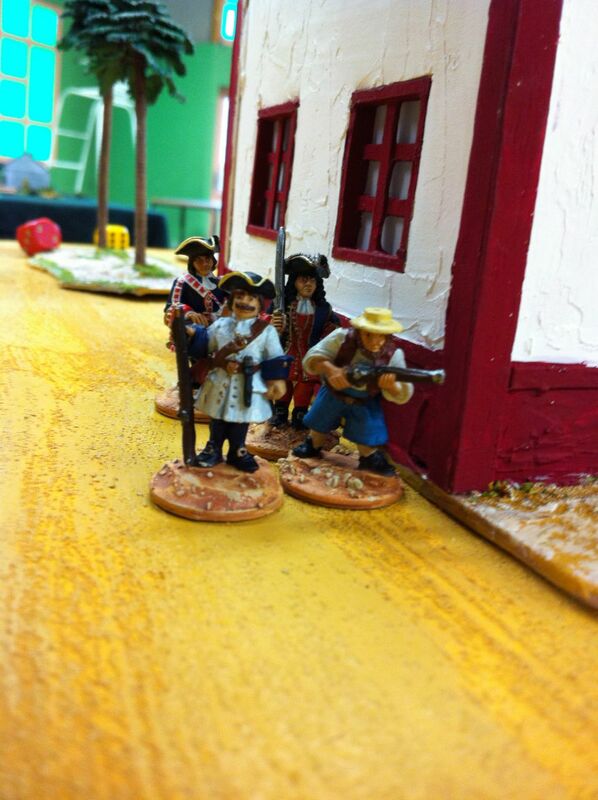 The French Marine officer advance in another street. The prisoner will soon be free. 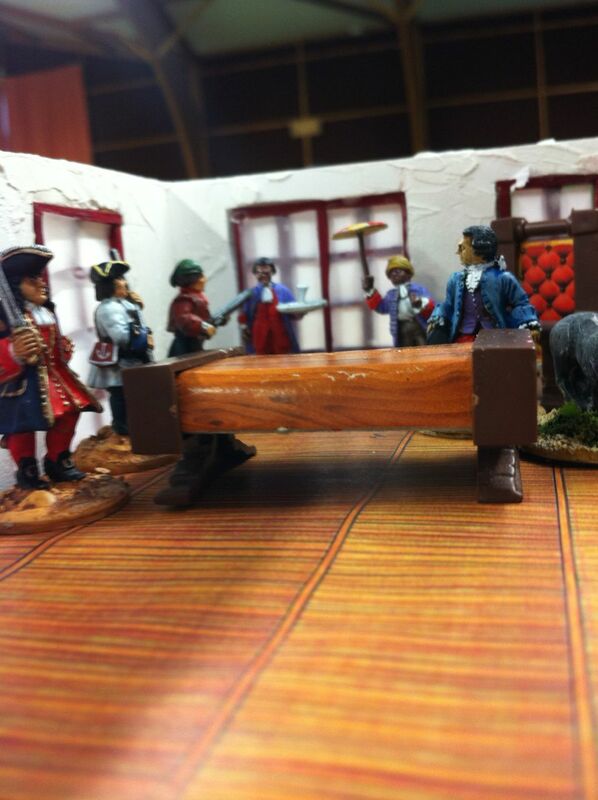 The English governor negociates with the attackers and offers £ 50,000 to save the town. He is cunning enough to negociate separately and the French let him do this! The French Marine player says he doesn't want any money and that the town must be given to France and/or Spain. 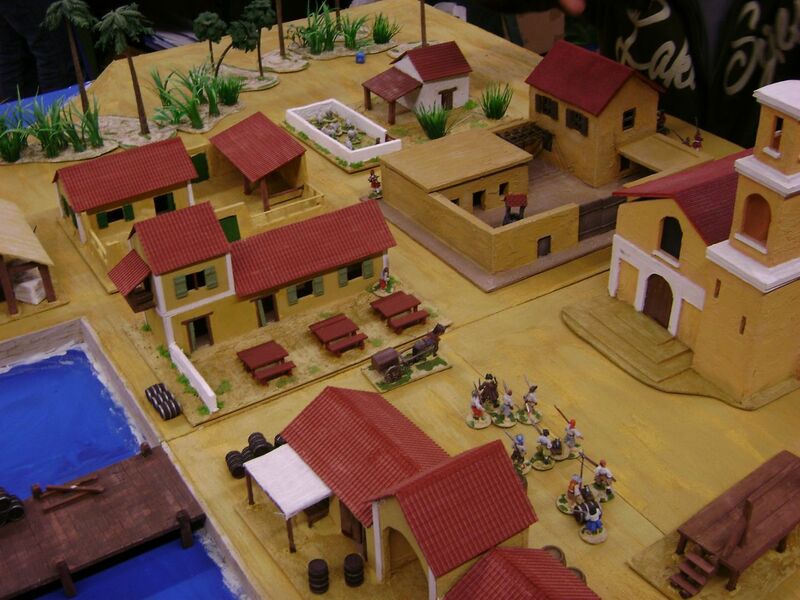 But the French privateer player says he accepts the money if the governor comes with them as hostage. The Marine officer has lost many men and cannot keep the town without the privateer, so he must accept to leave the town. The Marine officer and the privateer explain what happened to the French governor, who is happy enough to see his nephew alive. Then the privateer captain visits the governor's niece, Miss Clotirisse (a well-known character in our games! the governor is always very worried about his niece because the tropical climate is no good for her health, she suffers of nymphomaniac fevers). 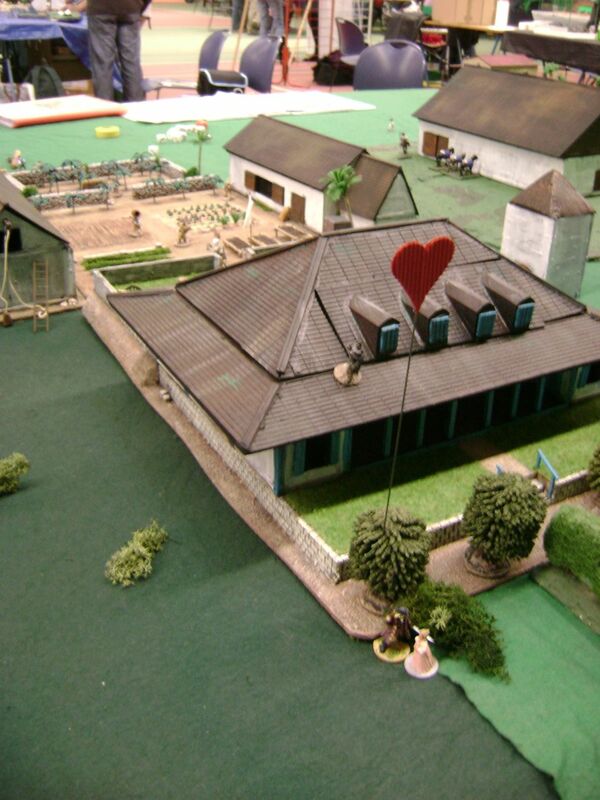 The privateer captain bribes the sentinel and the sentinel goes away so the captain goes in the bushes with the governor's niece for some time (small red hearts on a wire are markers of the number of game turns …this time there was only one heart: the captain was too fast!). But, look: a man is running on the roof, and soldiers are shouting! A man in dark clothes tried to attack the two soldiers who were guarding the hostages, but he failed! He jumps on his horse and rides away! The privateer captain shoots his pistol at him but misses. The French players have already seen this dark figure in the countryside, shouting insults at them: he is a former Spanish landowner who didn't accept the treaty of Ryswick which gave this part of the island to the French, and is a minor nuisance for them. We only know his nickname : "Zozzo" (in french language "un zozo" is a rather stupid guy). Some times later, the privateer captain notices that two soldiers go away with the hostage and embark them in a small boat. He manages to run after them and has to kill the soldiers who want to run to the English town with the hostages. 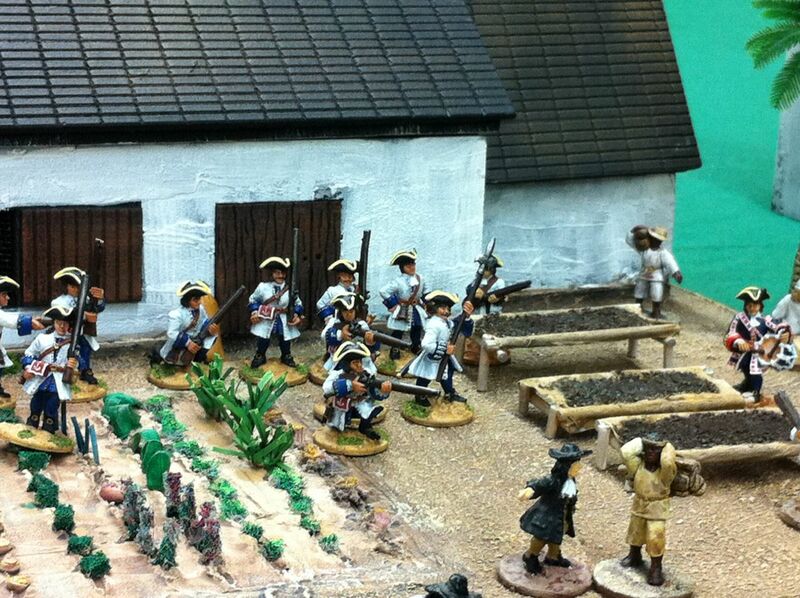 They have probably been bribed by the English governor, but the Marines officer is angry against the privateers and deploys his troop in the plantation. 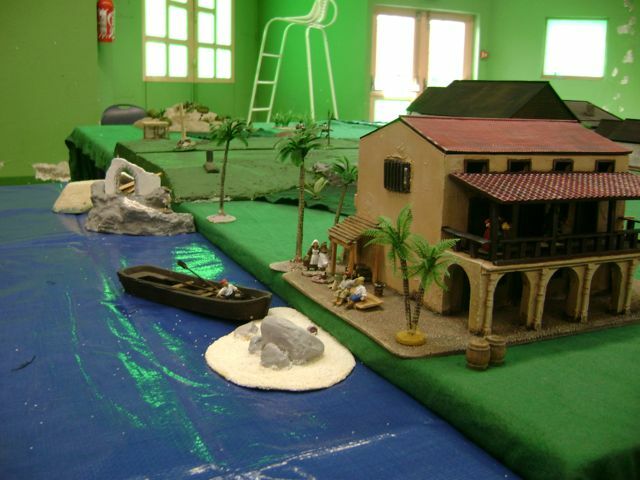 The Marine officer decides to leave the plantation, he will go to the inn near the beach (a nice place which certainly will cost a lot of money 300 years later!). The reason for this is: while raiding the English town, the French privateer had found clues about a treasure hidden on the hill near the plantation, and he has just found it. The English have brougth the ransom. They pay, and the hostages are released. When this is settled, the English player decides he still has some revenge to take. He burns the inn and advances his troop in the direction of the plantation. 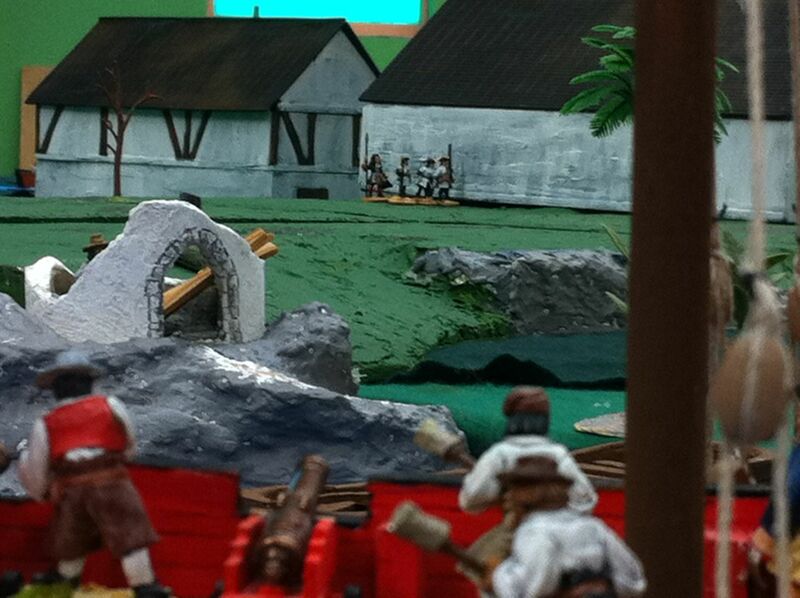 Gunners on the English ship shoot on some French soldiers who could attack the flank of the English troop. Much shooting. The English hesitate to attack in melee, and the French, who want to defend the plantation, cannot deploy between the houses. The French governor accepts a new negociation and will pay £ 6,000 to the English if they go away. This looks and sounds like ALOT of fun! 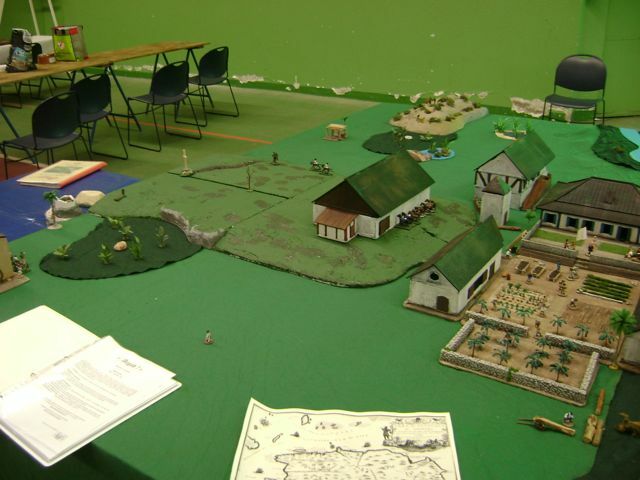 The use of 3 tables and the scenario details are brilliant. Thank you for sharing this. These mega games are sooo cool. Just love the game set up and the story. Thank you for letting us share in the fun. A salute from the Mid-Western U.S.
Keep making inspiring games. Thanks for posting the pictures. Fantastic looking game and brilliant report. I really liked the use of bribery to pay off the enemy! 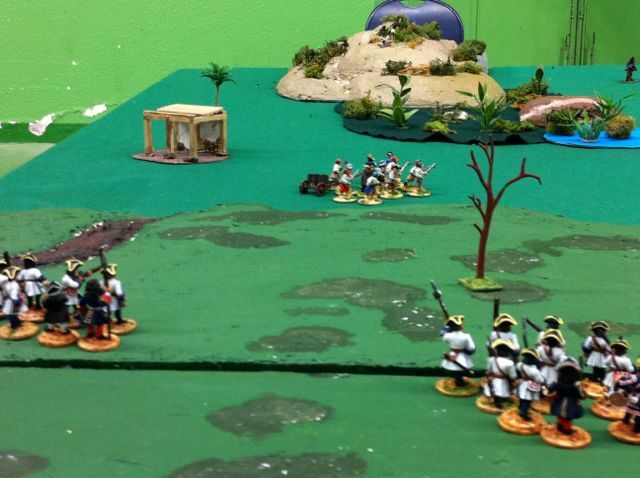 Thanks for sharing your pics, and battle report. I like the little details, and the bribery option is a good one - seems to have happened a lot back in the day. Which manufacturer(s) make the French Marines and English troops? what do you mean I'm stealing again? - what do you expect from a pirate!? I really liked the use of bribery to pay off the enemy! Yes we tend to negociate rather than get our soldiers killed to the last man. We have no rule about these briberies, it is just our feelings of logical things to do. 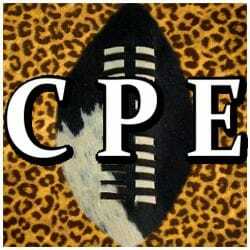 These are Front Rank. 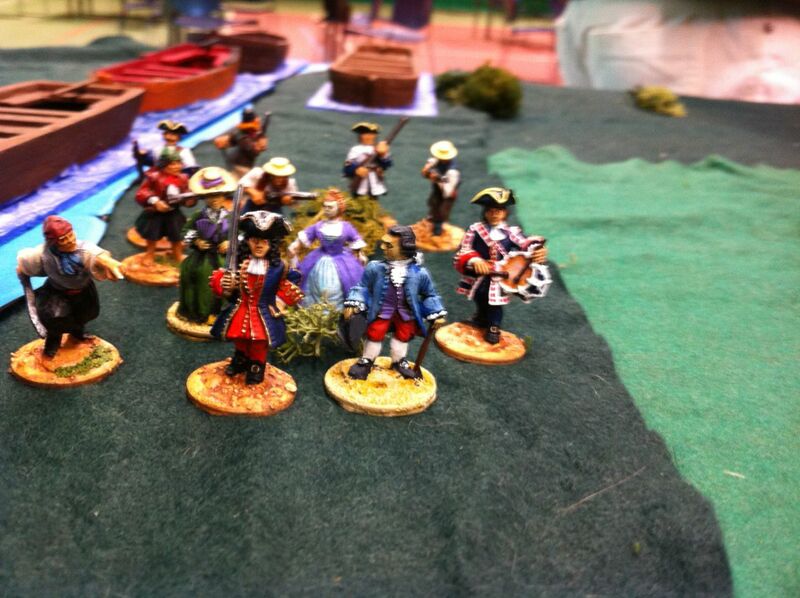 There were also many Foundry sailors in the game, and also some other miniatures, Old Glory etc. The Front Rank troops are certainly great for this period. 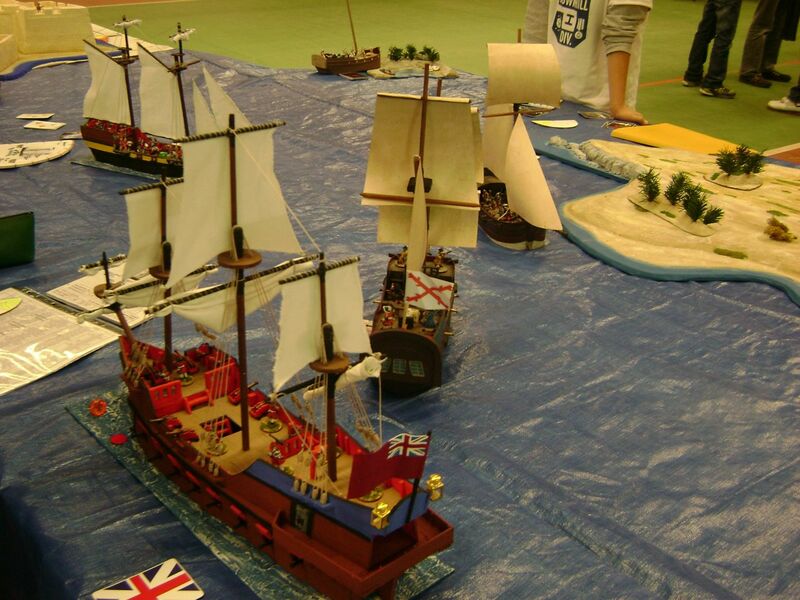 I love the large British ship in particular - any details or better pics? I was the French-Breton privateer in this adventure and we really had a great time. You can see other good pictures if you follow my report on our french forum. Our friend playing the Brits is a very hard negotiator but when he proposed me 50.000£ to leave the town, I couldnt say no Then the most difficult was to convict the French officer to follow me with the hostages who were under his control, because without hostages I couldn't be paid back. Impressive scale of action undertaken. Well done! Fantastic story and what a great adventure, now this is wargaming as it should be, allways! French Marines are mine. 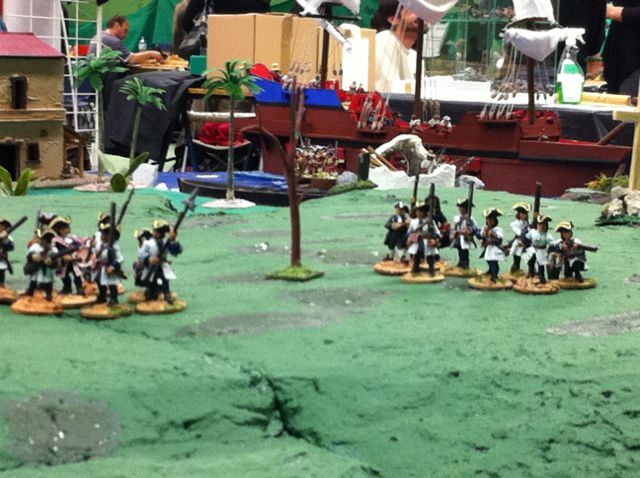 Its a mix of old real 25mm foundry and magnificent "front rank"
but since he changed the rigging, the painting etc. Yes! Thanks for this precision. "Give to Euthanasor what is Euthanasor's"
Three words for you mister: Lots of envy! 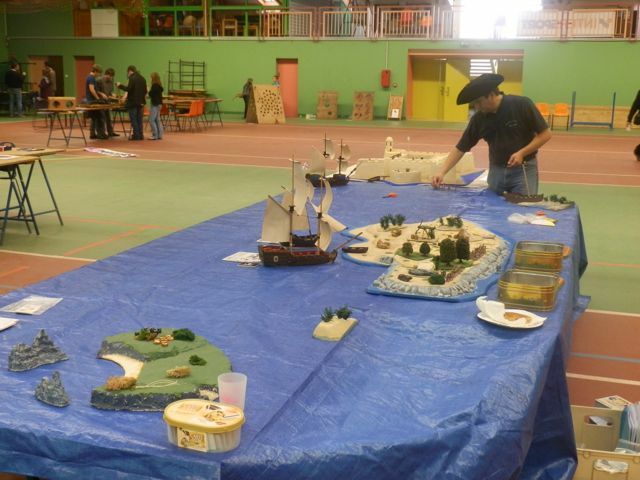 photos of our wizzkids pirates game. 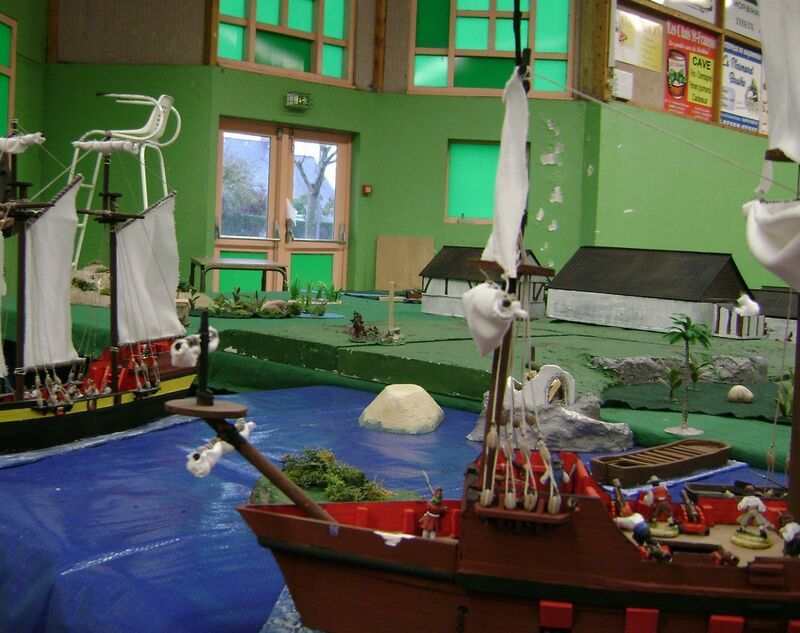 Anyone Here Done A Pirates VS Cannibals Game?